Our featured member this week is Khurram Rafique. Based in New York, Khurram is an expert in the mobile, media and internet industries. Continue reading below to find out more. I was curious about Muppies and thought it would be a good forum to connect with fellow professional Muslims. I have found it to be much more than a professional network. It is a very active community with passionate members. Particularly, I enjoyed attending the recent annual event held in New York. I think Muppies has done a great job of organizing and the model is quite scalable to other geographies. I try to live by the philosophy that the beachheads of today are the abodes of tomorrow. We all have comfort zones that we like to live within. But at times one has to go to the boundary of their comfort zone and try something new, or in other words, create a beachhead. Over time, as we keep pushing our limits, we become comfortable enough and start owning new ways of thinking or doing things. Human mind is capable of achieving a lot and we should never be afraid of pushing ourselves. I think it was Ali ibn Abi Talib who said, “I am the slave of he who teaches me even a single thing.” We can learn something from everyone. With the digital age and people moving across the globe, I think it is more important to be aware of our personal learning needs and always be on the lookout for people that we can learn from. Developing relationship is a key life skill and we should all invest in it. I really liked Professor Edgar Schein’s work on trust and relationships. His book titled ‘Helping’ greatly helped me – no pun intended – in learning about the nuts and bolts of relationships. I graduated first in my high school class and came to America with much ambition. Once I started my first undergraduate semester, I went through a big culture shock. As a result, my grades tanked and I ended up being on probation. I was devastated. What hurt the most was that I did not have anyone around me who knew me well enough to encourage me. I learned to pick myself up. It took me years to gain back some of my confidence. But in that process, I grew the mind of a beginner and the ability to bounce back. As I see it, the top-down command and control model is being replaced by leading-from-the-center model in the organizations around us. Future leaders need to earn the respect of and build connections at all levels of the organization. At the same time, leaders need to be connected to their own psyche and be fully aware of their biases and blind spots. So in practical terms, be humble, acknowledge the people around you, and be curious about everything. I have a pretty low-tech tip that I can share: write things down as a list, and keep going back to the list until you are done. I never thought I would be in marketing. I wanted to be a scientist and do research. Things happened, and they keep happening. I stay open to new possibilities and analyze options as I go. Business school can help us in many different ways. Once I started as an engineer, I thought I could do more, and got my business degree to switch to the business side. It worked. I have to say, I learned a lot. My program at MIT was amazing. At its core, business school teaches you to look at the world in a very holistic way. You think differently about the economy, about businesses, about people and about yourself. I really enjoyed it and highly recommend it. 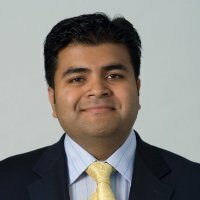 Connect with Khurram through his LinkedIn profile.